If you’ve come to this page, you’ve likely had a difficult time finding the information you need related to penile implant surgery - You are not alone in your search! Surgeo offers comprehensive, flat fee penile implant surgery packages with highly qualified surgeons for the treatment of erectile dysfunction. See all our current package locations below. NOTE: The penile implant surgery packages listed on Surgeo are performed for treatment of erectile dysfunction. The services are NOT available for cosmetic purposes (i.e., enlargement). 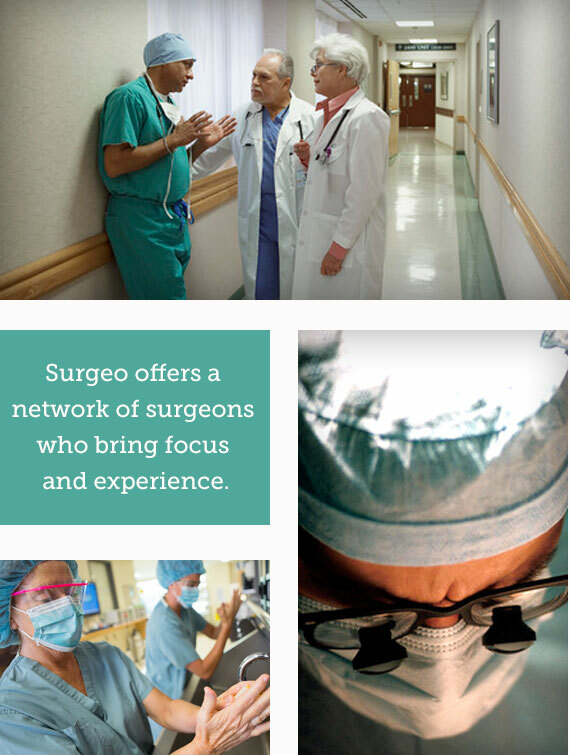 Qualified Surgeons: At Surgeo, we use a peer credentialing process to build our network of surgeons. This means that we only bring in the surgeons that we would go to ourselves. So of a potential 10,000 surgeons who may be licensed to do penile implant surgery, we have brought in only 18 surgeons (thus far) in the United States. We know every one of them and have done extensive backgrounds on each, including confidential checks with other surgeons who've operated with them. This network of surgeons has done nearly 25,000 penile implant surgeries. You won’t find every surgeon on Surgeo, but you will find the right ones. Flat Fee: If you’ve had the pleasure of shopping for surgery, you know that it can be nearly impossible to get to the actual total cost. Here at Surgeo, we’ve taken care of all of the pieces for you. Every package includes the following: Surgeon, anesthesia, facility, implant and complications protection. All of this is available for a flat fee that is clearly communicated with each package. You can click HERE for a PDF that outlines details of what is included in the penile implant surgery package. Who/What is Surgeo? We are a new kind of company, founded by a surgeon, that was a result of a business model developed to help uninsured patients get the surgery they needed. It took us nearly two years to find, qualify and contract our existing network of penile implant surgeons around the United States and abroad. We've also contracted with the facilities, anesthesia providers and implant makers. Having our own personal experiences with various surgeries, we are driven by the desire to make surgery more accessible to people that need it. We have several locations, below you will find each of them along with their associated price. If you are interested in proceeding and would like additional information, please click on the package location and you will be taken to a consultation form. This form requests basic health history information that we provide to the selected surgeon for an initial review of your case. We'll reach out to you upon receipt of your consultation form to let you know we have it and we will then contact the surgeon (please check your spam folder if you have not heard from us). If your selected surgeon agrees you are a candidate for penile implant surgery, we will then assist you in making arrangements to meet with your surgeon and schedule the surgery. We are always here to help you in any way that we can. We know this is a significant decision that requires a lot of consideration. If we can be of any assistance, we welcome you to contact us and we'll get back to you as soon as possible. I would recommend you all to anyone who needs help with surgery!